Attila the Frog is one of the Punk Frogs. 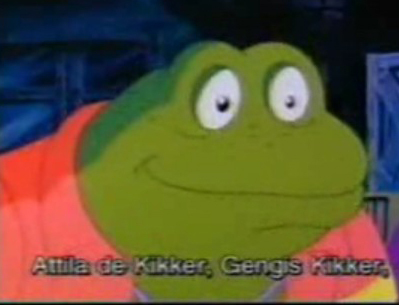 He first appeared in the 1987 series, in the episode Invasion of the Punk Frogs. He was a humble, naive tadpole, until he was accidentally mutated, then tricked by The Shredderr to join his cohorts for evil purposes. When he saw Shredder’s evil ways, Attila realized that the Turtles were his true friends. He makes a brief cameo in the first episode of Mutant Turtles: Chōjin Densetsu Hen.